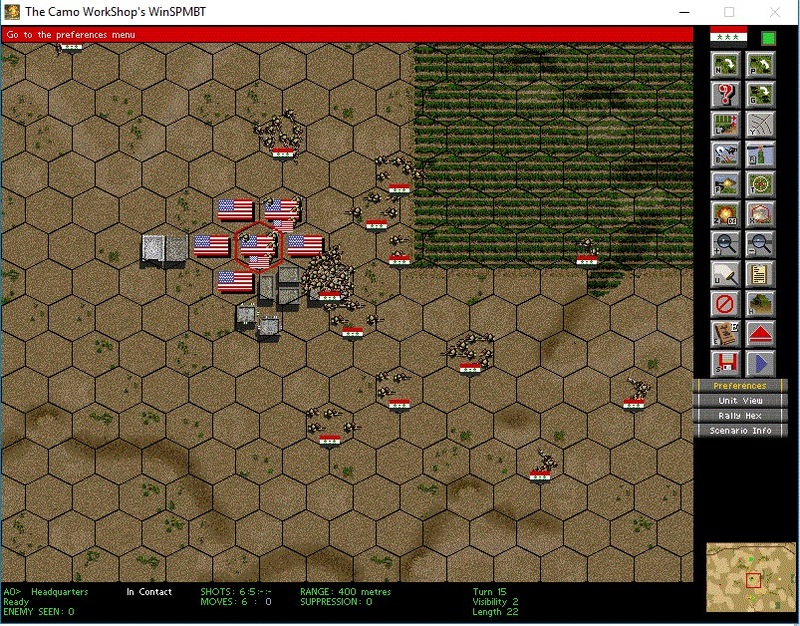 A user-generated campaign of 20 battles, taking place in 1991 shortly after the First Gulf War, in an "alternate" universe where the victorious coalition is actually dismantling the Iraqi state, rather than just liberating Kuwait. Human player has Iraq, and the three selected opponents are United States, Great Britain, and Saudi Arabia. This AAR is loosely based on the theme of the "Last Legion". There is an empire/country (here, it happens to be Iraq around the First Gulf War) that is crumbling under the weight of a foreign invasion, but a group of poorly trained and demoralized soldiers has decided not to surrender. This is because they have heard a rumor (it's hard to call it intelligence) that somewhere, there still exists a Last Legion (here, perhaps a Last Republican Guard regiment) that is making a last stand against the invaders. 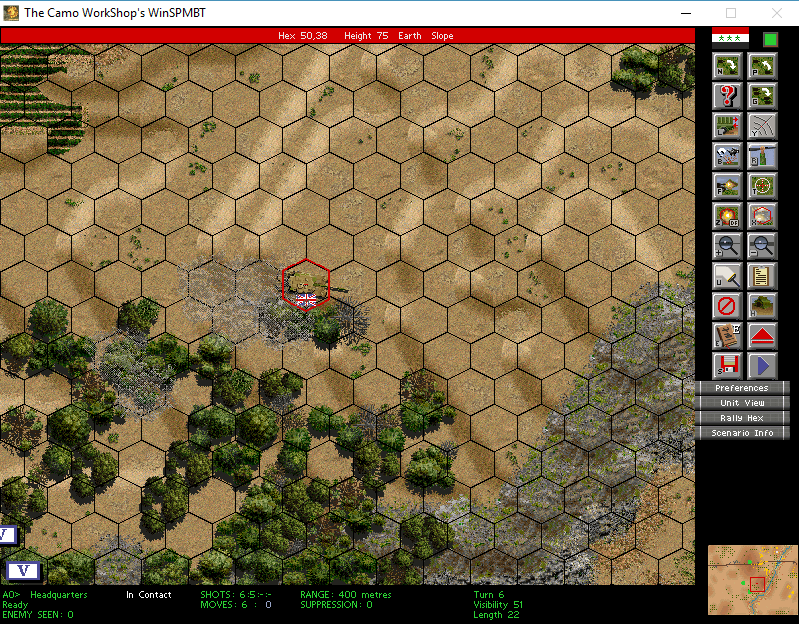 Despite the hopelessness of the situation, the rag-tag group of soldiers decides to fight its way toward that last stand, picking up any stragglers along the way. The search for the Last Legion becomes at least as important as what happens when it is "found". 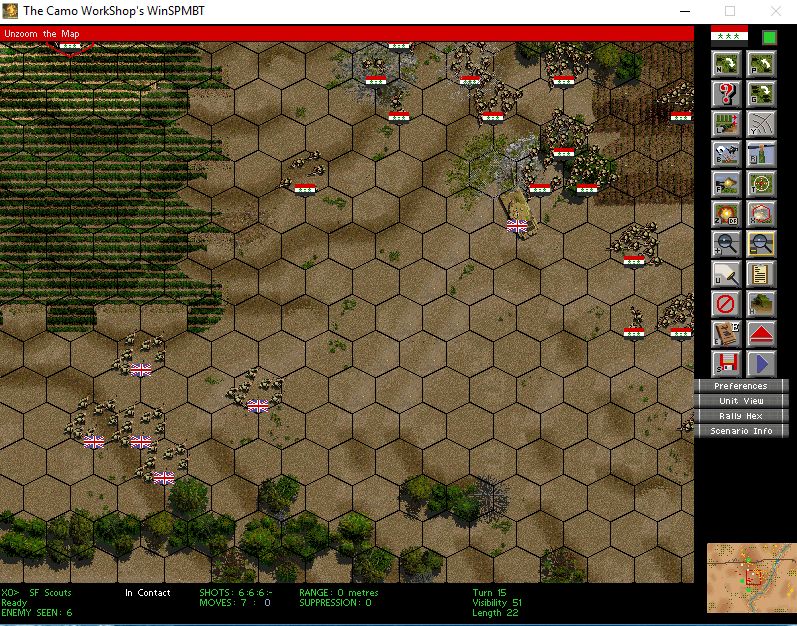 In line with that theme, the Iraqi units in this campaign are, at first, intentionally of low quality. However, they do have an assortment of support weapons, perhaps picked up from their defeated comrades (these troops aren't trained to handle more sophisticated equipment, and the support weapons they picked up reflect that). Because they are outside of a normal chain of command (which no longer exists), their attitude is not to win at any cost, as they may have been ordered to do if the Iraqi regime was still around; rather, any victory in battle has to be carefully measured against expected losses. After all, their overriding objective is to find the Last Republican Guard Regiment and to actually be of use to them in any future battles. Since the Iraqi troops are assumed to be moving around and picking up stragglers, some limited core expansion can take place during the campaign, and replacements are also possible. 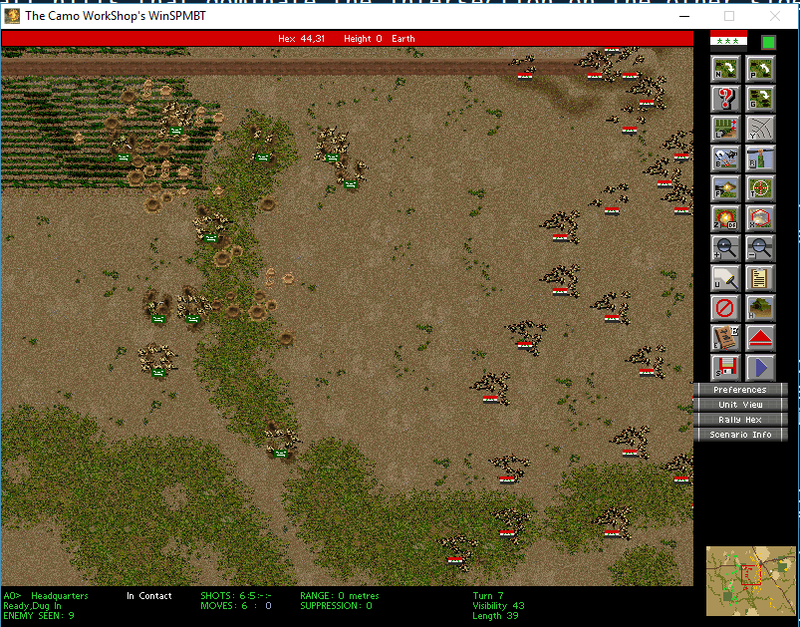 However, because the battalion is on the move, any unit with a speed of 3 or less (mortars etc.) will need its own dedicated transport. The map and positioning of VPs is straightforward: there exist no elevation higher than 10. 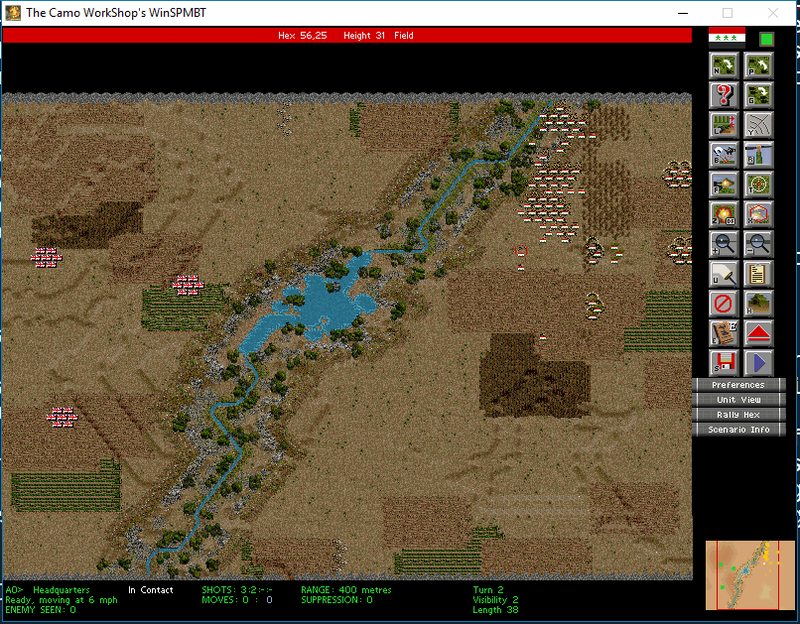 Three VP clusters are in a vertical line; the top one is on a mesa or plateau, but close to plateau's edge from my troops' point of view, the middle one is right in the middle of a plateau, but there is a small village right there, and the bottom one is on flat ground, but with a small ridge just to the West of it. These terrain features, as well as the low visibility, will prove crucially important. My troops set up in a line, with each Peoples Army company assigned one VP cluster, and each company is backed by exactly one of each type of support weapon - one HMG section, one RPG section, etc. This will of course result in many of these support units being out of contact with their platoon leaders, but these types of command and control problems are to be expected with this bunch. The HQ keeps the weapons platoon with its three mortars and three pickup trucks in reserve. Because of the low visibility, there never was a moment where my troops would have a good overview of the enemy advance. It turned out that the Americans decided to attack only the middle and lower objectives; the middle objective was attacked by a platoon with 10 night vision. All of these factors proved decisive. My troops in the south achieved basically a "reverse slope" situation. They sat right behind the low, single-hex ridge, and as the U.S. troops crested the ridge, the Iraqi soldiers would be able to get a first shot against them at point-blank range. Because the U.S. troops had no vision advantage, they could not take positions further away on that ridge to provide supporting fire. In the middle, the U.S. infantry squads had night vision - but because there were a few buildings to completely block all vision, they could not fully utilize the advantage. Nevertheless, there were situations where the Americans were able to shoot the Iraqi infantry with complete impunity, inflicting punishing losses on the green Iraqi troops. In turn, the Iraqis would rarely begin a turn with more than 1 U.S. unit visible. The village was briefly captured by the U.S. infantry. What turned the tide? Certainly not the HQ or the three mortars, as due to the low skill, their fire was slow in coming and scattered, hitting both sides about equally. Instead, it was the support weapons, and in particular the HMGs and AGLs that, when Z-fired at the areas where invisible shooters were firing from, were able to pin and suppress the superior American troops. The numerical advantage of the Iraqi troops (cost-wise, a Peoples Army platoon is worth about one American vision-10 infantry section) could then be used to advantage, as the Iraqi troops, even when advancing blind, would not get shredded before they closed to 1-2 hexes. 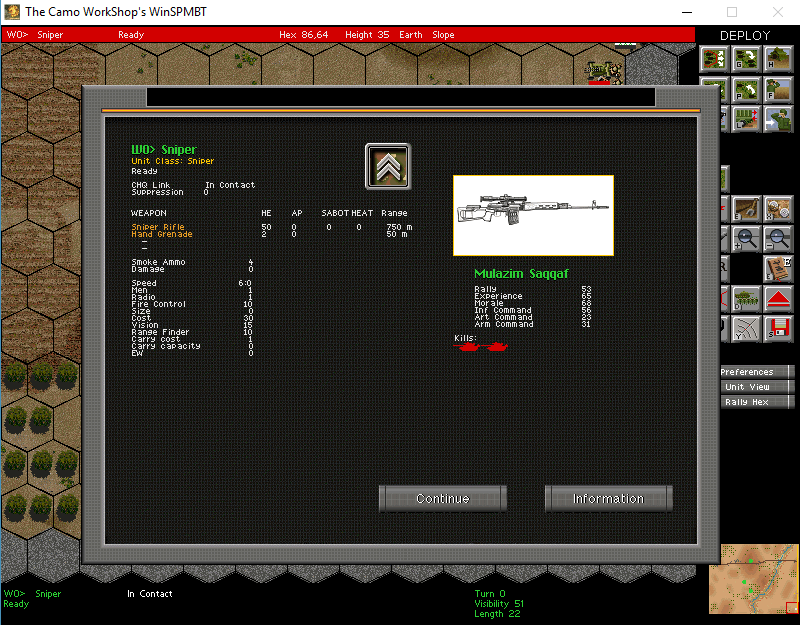 Realizing the difference these weapons were making, I moved the AAMGs and the two HMGs from the weapons platoon to provide further support - but then their pickup trucks got decimated by American ATGMs, with vision far superior to anyone else on the battlefield. Nevertheless, in the end, the superior numbers took their toll, and Iraq was able to capture all the VPs before the time limit ran out. Last edited by raginis; July 25th, 2018 at 01:01 AM.. I assume no heavy elements of the Americans were present? Thank you. From what I understand, the size of the enemy force is directly related to the size of my force - since my units are so cheap, the AI fielded about two reinforced platoons. A Dragon unit is worth about as much as three platoons of Peoples Army. I see this as a potential problem for this campaign long-term - I want my units to go up against superior opposition, including advanced fighting vehicles and airplanes, but the AI may never have the points to field such units. One possible solution is to buy several platoons of (for example) T-55 tanks and to keep them out of harm's way - given how many things can kill them, green T-55s will never be the decisive weapon in any engagement, but they will give the AI additional points to play around with. The first battle is over. A number of green troops advanced to be regulars. The dead were buried with honors, and as the survivors regrouped and gathered what weapons and supplies they could, some stragglers came in to replace the lost ones and even grow the force slightly. With a victory behind them, the first signs of cohesion grew among the soldiers, and in honor of their commander, who achieved that first victory, the men began to call their ad hoc battalion Mustafa's Marauders. Mustafa's Mobile Maniples had been bandied about, but no one really knew what it meant, so the subject disappeared quickly. Lt. Col. Mustafa's experience in the first battle slightly improved his ability to command artillery. Since his HQ unit has 10-vision and size 0, the Lt. Col. is planning to take a more active role in future battles, as a forward arty spotter/scout. 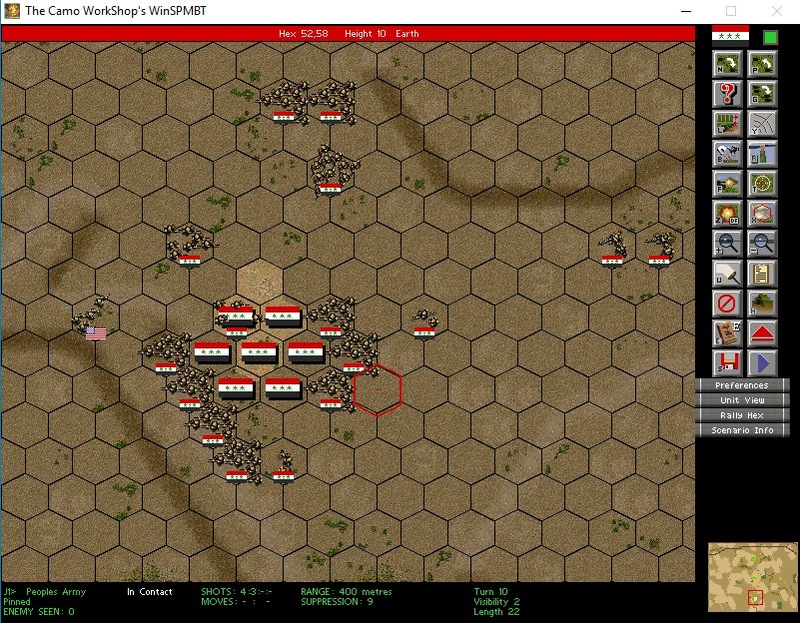 Perhaps attracted by the sound of battle and the news of a rare Iraqi victory, several Iraqi units who had not yet given up completely managed to make contact with the Marauders and agreed to join them on their quest to find the Last Republican Guard Regiment. These include a new sniper, Mulazim Saqqaf (as more of an elite unit, he found it easy to survive the initial defeat of the Iraqi regular troops; he hopes to develop a healthy rivalry with the other sniper, Mulazim Qattib), as well as some Special Forces scouts (with NO night vision!) and a section of 120mm mortars. These mortars are too heavy for a pickup truck to carry, so unless the Marauders can scrounge up some transportation, the mortars may have to be left behind. Following a lead about the possible location of the Last Regiment, the Marauders approach a river that has subsided to the point where it is little more than a stream, although in places the stream spreads out to form mini-lakes. The river valley runs SW to NE, and is full of rough and difficult terrain. No convenient bridge exists, but before the force can even attempt a crossing, they are met by a squad of sappers. The sappers offer no good news - an unspecified force of Coalition soliders, possibly British, have been seen fortifying the opposite side of the river. While the British force's objective may be unclear, the Marauders' choice is anything but - they must cross the stream even if it means an assault against the prepared British position. Fortunately the sappers, all three platoons of them, agree to assist, and they even call up the help of two 130mm field gun batteries, which have yet to participate in the war. 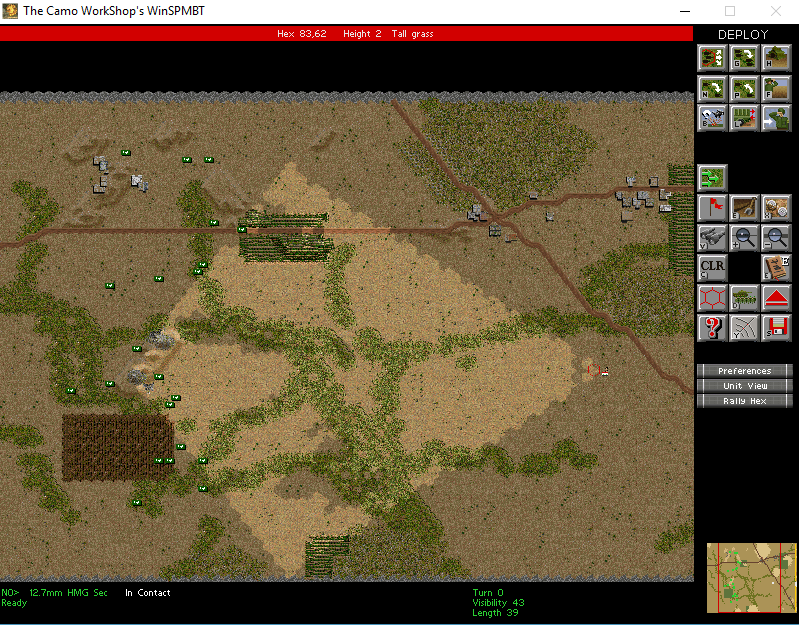 As before, VP location, the terrain, and visibility, are all crucial to this battle. 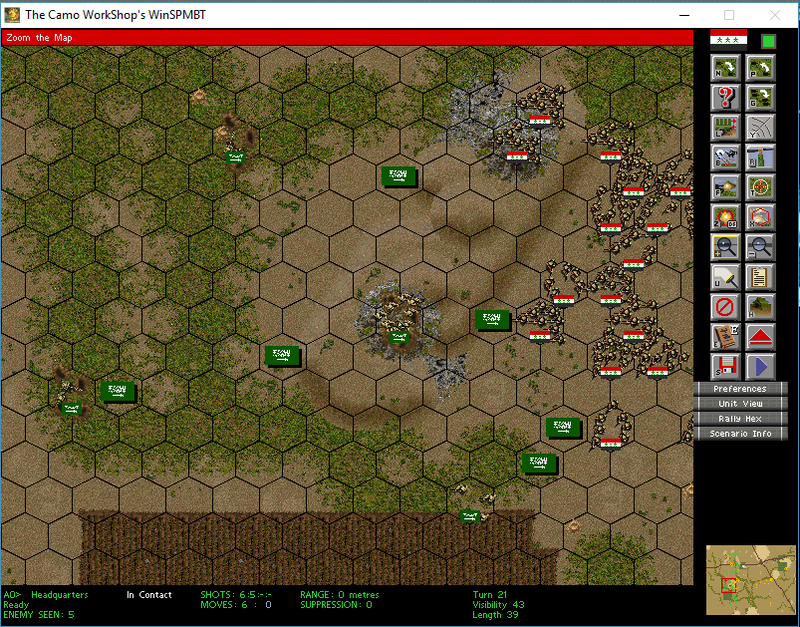 Two VP clusters are located toward the northern side of the battlefield, so these will become my primary objective. There is hope, if not ambition, to captue the lower VP cluster, but capturing the top two and getting most of force across the river valley should be enough to count as a "win" in this battle. The crossing will take place in the far north of the battlefield. Since the valley runs SW to NE, in the northern part the valley is close to the Iraqi staging area, and far away from the expected British staging area. Therefore, in the northern part of the river valley, there should be no British troops dug-in among the rough terrain on the other side of the river valley. Everywhere else, the Marauders would run the risk of encountering NV-equipped British units, dug in on rough ground, and defending a river crossing. The elevation on either side of the valley is about 30 - meaning that Iraqi support weapons, positioned in rough terrain on the eastern side of the valley, will have good fields of fire on the western side; to silence them, the British troops will either have to bring overwhelming firepower or attempt to cross the river bed and stream themselves. 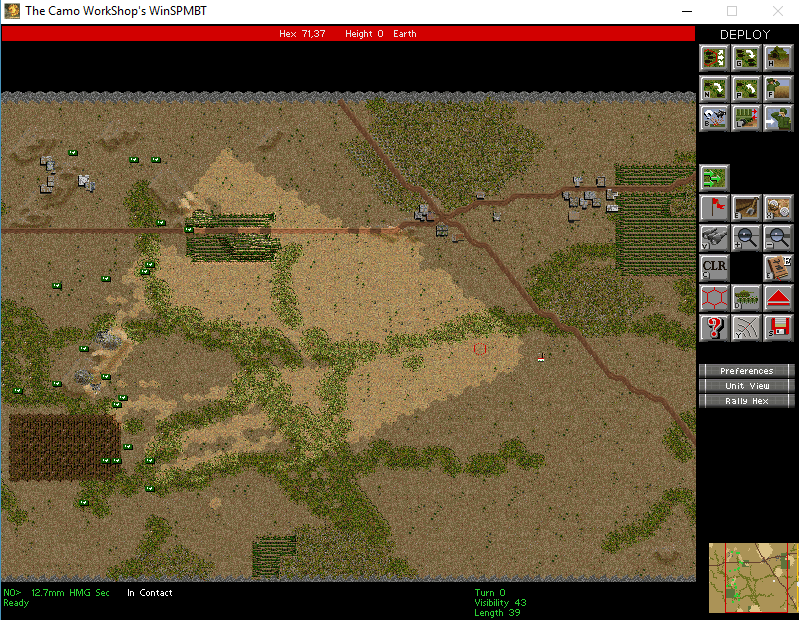 With the above in mind, the entire infantry force is massed on the northern side of the map, and it will cross the river valley as quickly as possible. The HQ unit and the two snipers are the ONLY units with NV; all others, including the sappers and SF recon units, have visibility of 2. Therefore, the HQ unite and the snipers will cross the river as well, and will act as spotters and scouts. I never tried it, so I don't know how it works, but when you create a new game you have the option to set the points for each side. Perhaps giving more points to the enemy side would work. Or, if that failed, perhaps not using all the points yourself.? As expected, there was no British opposition to the crossing itself. The first British unit was encountered well back from the river, with a field of crops providing it some concealment and allowing it to fire on the Iraqi troops as they emerged from the river valley. Why is the SA80 so much more accurate than its Iraqi or American counterparts? I don't know. Combine it with the fact that this British infantry section has 2 MGs at its disposal, with ACC of 30 and KILL of 5:0 (extra accuracy is, presumably, just a way to model the fact that there are two MGs in one weapon slot), and the fact that it had a NV of 15 - and what you have is a Terminator unit, all at a cost of 29 points, compared to 13 points for a Peoples Army squad (at equivalent experience). Peoples Army, again, are armed only with an AK/Mosin and grenades, with no NV. Still, as this battle showed again, there is no fire like Z-fire. The battle settled into a pattern - a Peoples Army squad would advance, hoping to draw fire, and then either a sniper or the HQ would attempt to spot the firing enemy unit. If they fail, the hex where the fire came from, if identified, would still be subjected to Z-fire from HMGs, 60mm mortars, and AGLs, as well as the MGs on the trucks. 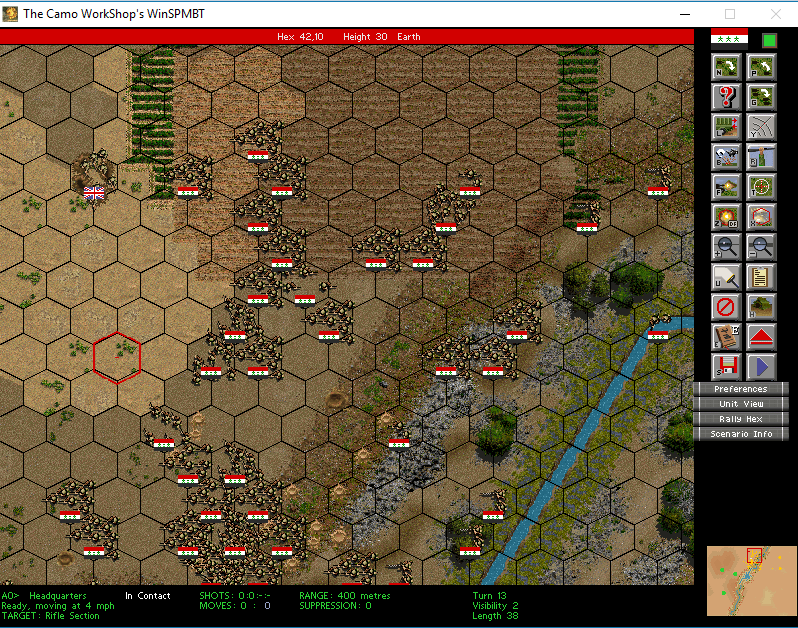 After a few rounds of suppressive fire, another infantry squad would advance, and either draw fire or close with the enemy unit. This was a costly strategy, but the damaged squads could always be withdrawn (except when they couldn't - a couple of enemy units entrenched in the river valley were able to fire on retreating Iraqi squads; the only three Iraqi squads that were eliminated completely died in this fashion). In the end, no more than a marginal victory was achieved. The final VP cluster remained out of reach. With only three units - the HQ and two snipers - able to match the British units for visibility, it was simply not feasible to push too hard for that third VP cluster. 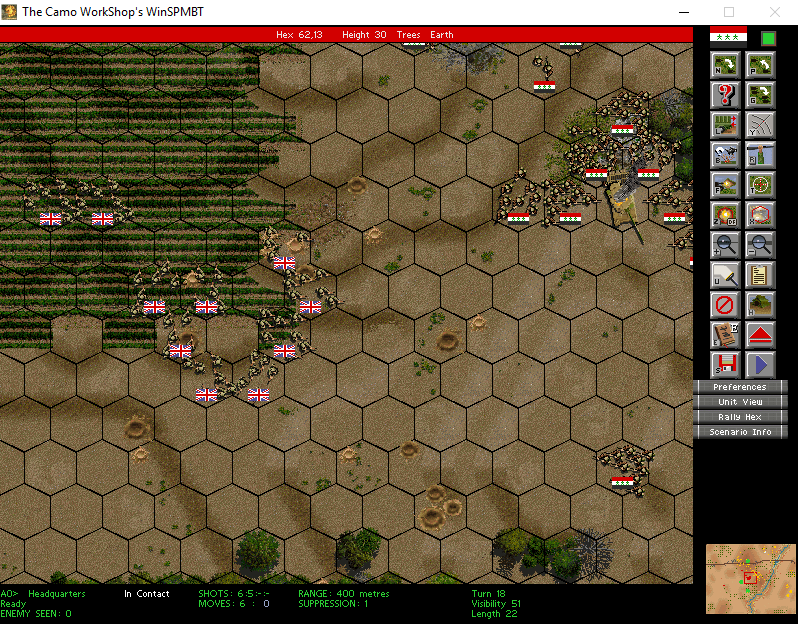 The British fielded a reinforced rifle company (so roughly 1/3 of the force I did), with no air support or armor. 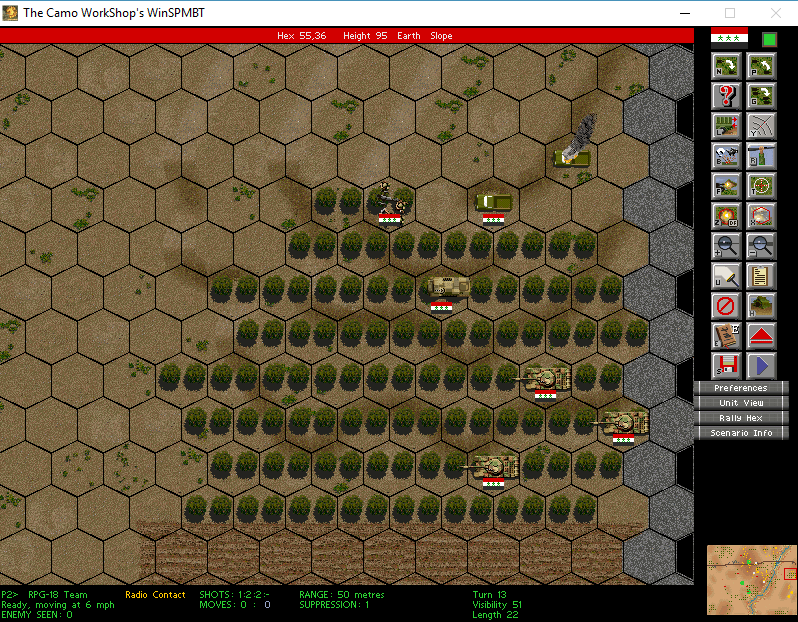 However, their infantry units were so effective that they could stop my infantry in their tracks. A few units are no longer green recruits, but no one is a veteran, yet. In fact, one of the Peoples Army squads that had to be completely replaced was also one of the high-experience units (by which I mean - about 60 morale and experience). Finally, a fight with high visibility. I expect that every unit will get some shooting experience. It is an assault, and the two engineer platoons who had temporarily joined up with the Marauders will hopefully clear any obstacles. The two 130mm batteries, with their 10km range, are also in touch and ready to provide support. Since this is an assault, both the attacker and defender start dug-in. Due to the high visibility, a number of Iraqi support weapons will never need to move, and will still be able to direct-fire against the expected first line of Saudi defense. Unless the Saudis have excellent spotting ability, or decide to advance, they may spend the battle under fire from (to them) unreachable, perhaps even invisible, dug-in HMGs and mortars. In fact, this battle will be in a way the mirror image of the previous two - the Saudis may be able to see who is shooting at them, but won't have the range to engage them, as opposed to Iraqis having a 500m-range rifles, but not seeing anyone beyond 100m. The Iraqis set up in a line, but without attempting to cover the entire height of the map - the main axis of advance will still be along either side of the road, with an additional company further south. I make a mistake here - the hills in the north offer at least some break to the line-of-sight. The AK-47 company would probably do better there, able to close to 400m or less more easily. 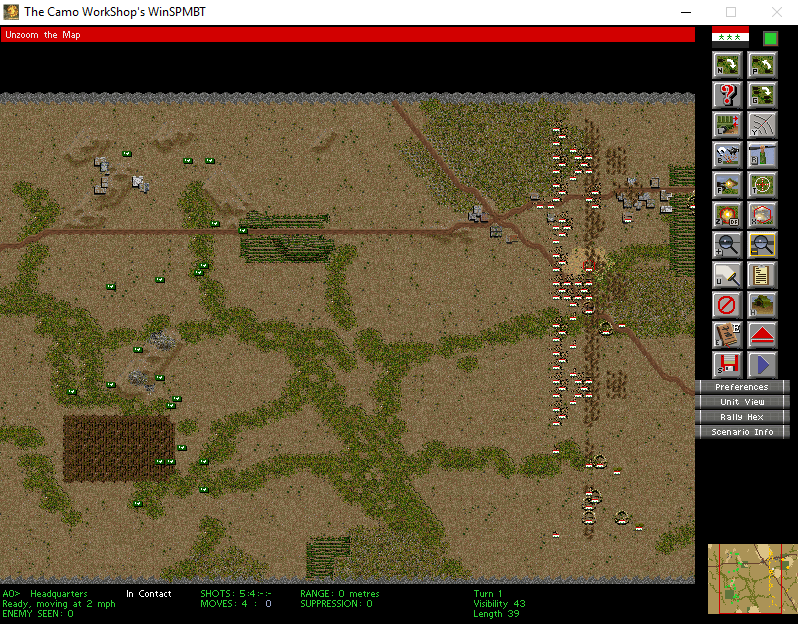 Instead, I deploy them as the southern-most company, facing the fewest natural obstacles and the longest fields of fire - a job for which the Mosin-armed companies would have been better suited. 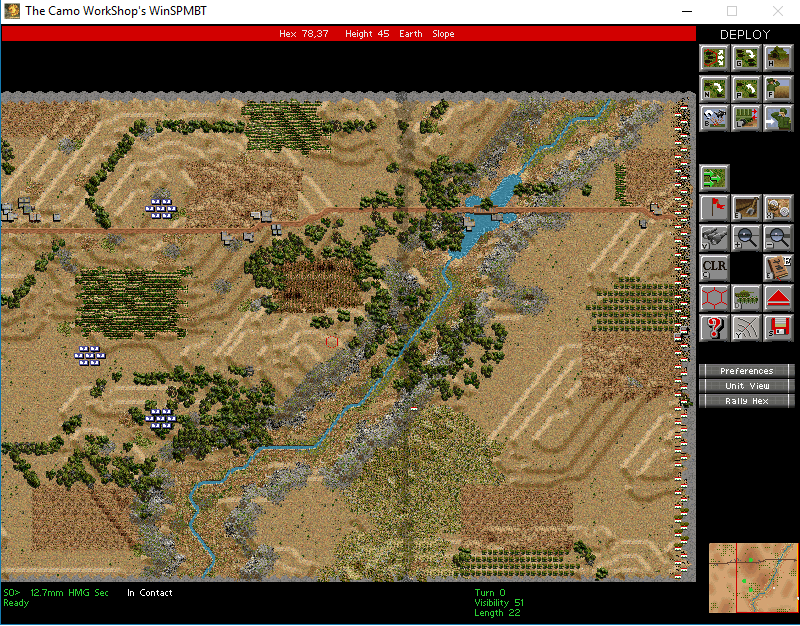 The ranger platoon will move along the road, behind the general advance, and hopefully provide a decisive punch if the enemy defensive line proves too stubborn. The sappers have AK-47s, grenades, flame throwers and satchel charges - in other words, at ranges beyond 50m, they are no better armed than a Peoples Army AK-47 squad. The Peoples Army grunts advance to contact, and find it about where expected. Several Saudi platoons, supported by a few MGs, are dug in around the hills next to the road. Their FN-FAL rifles are actually less lethal than the AK-47, but more lethal than the Mosin, while sharing Mosin's range. Of course, each Saudi squad also has an MG, which is distinctly average in terms of lethality and accuracy. Nevertheless, the Peoples Army squads will engage at range, with support weapons used liberally to pin/retreat/rout the Saudis. 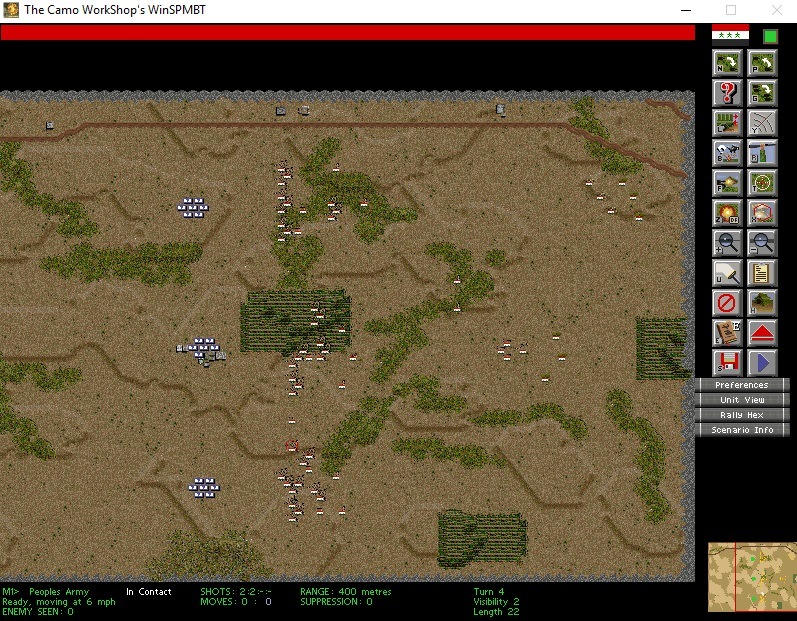 For the first time, Peoples Army units will get to see the enemy they are fighting at the same time as the enemy sees them, and will get to shoot back when shot at. The battle against the entrenched Saudis raged on, and the initial mistake of deploying AK-47-armed People's Army units in wide-open terrain became more glaring as the fight progressed. Since the AK-47 company was also the southern-most company, the ended up advancing into the teeth of several Saudi platoons that could shoot them from 600m with impunity (AK-47 has only a 400m range) and, on top of that, there were no friendlies on their left flank. 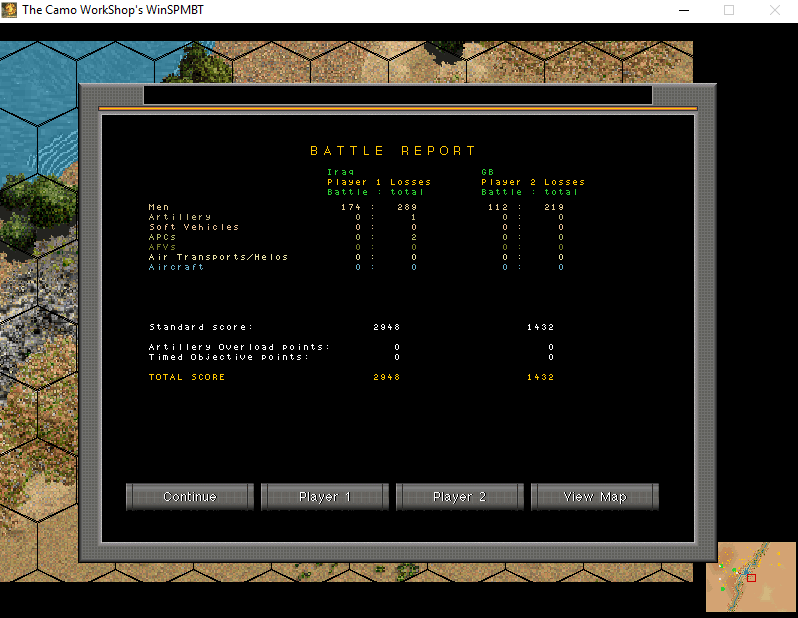 I ended up withdrawing them until the northern two companies, assisted by the mountain platoon, could punch through the Saudi defenses in front of them. 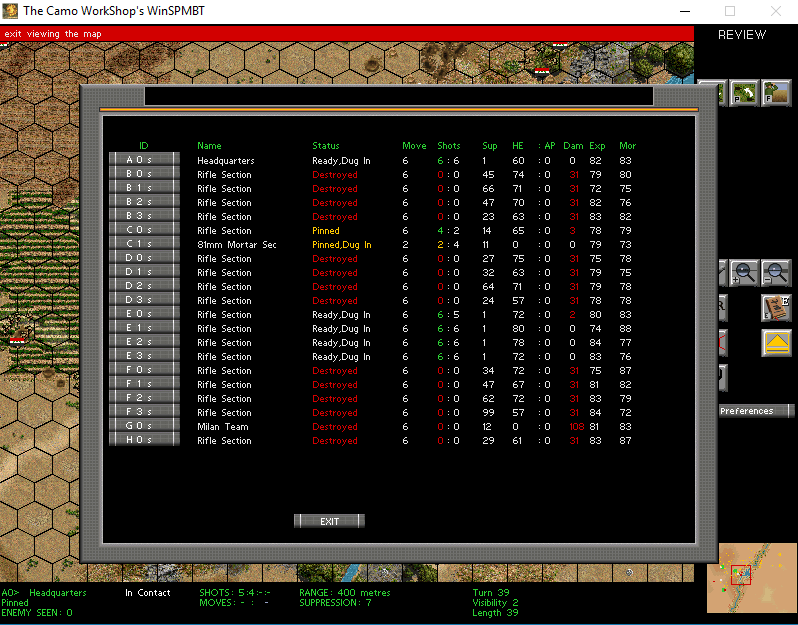 The only late-game surprise came from two MG sections positioned behind a small hill that protected them from head-on fire, but allowed them to harass my units from the flank as they advanced. It took a few turns to defeat them, but they could not turn the tide. Overall, the first high-visibility battle was also the first battle where the Marauders inflicted more losses than they took. The Saudis brought just over 3 companies of infantry and nothing else to the battle. 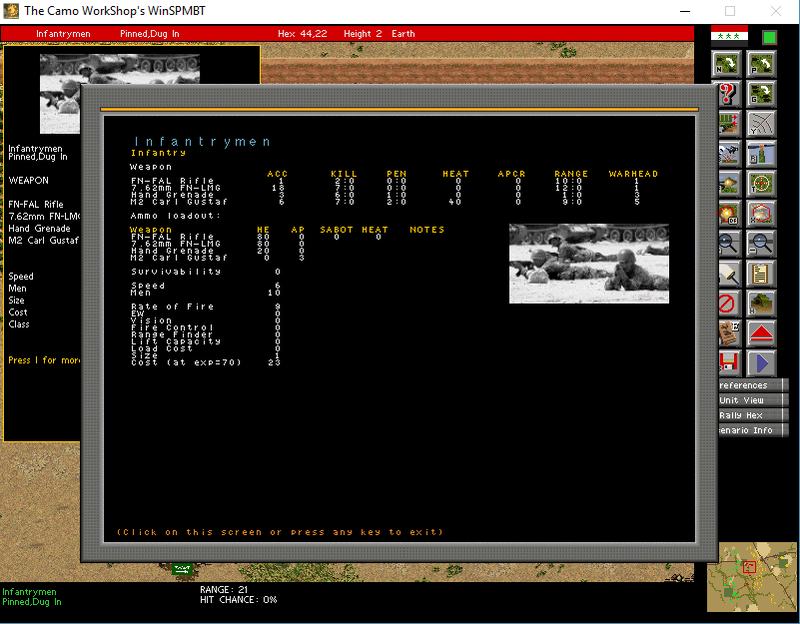 Lt. Col. Mustafa has grown quite nicely in the last few battles (I apparently wrote over the saves from the 1st battle, so I don't know what he looked like at the beginning of the campaign). Huge growth in Morale and Arty Command (which makes sense, as he calls in all the arty strikes). Now, the manual states that the Sniper class has a built-in accuracy bonus. I don't know if the HQ class has any built-in artillery bonus, but I won't be purchasing a FO for this campaign anyway. I should note that Lt. Col. Mustafa has never even stood next to a tank in his life, much less commanded one, so I can't explain the Armor Command increase. Sniper Kattib doubled his kills over the last two battles, and his experience and morale has also grown. He will not be the first Veteran among the Marauders (a 12.7mm HMG section took that accolade), but he's doing fine. Sniper Saqqaf has his work cut out for him if he wants to catch up. The HMG unit that acquired veteran status has only two kills - so kills really aren't that essential for good experience growth. I'm guessing the real consideration here is simply shooting the enemy a lot. Last edited by raginis; August 5th, 2018 at 01:47 AM.. Yet another brook, yet again flowing from NE to SW, but this time there is a bridge, and a road! 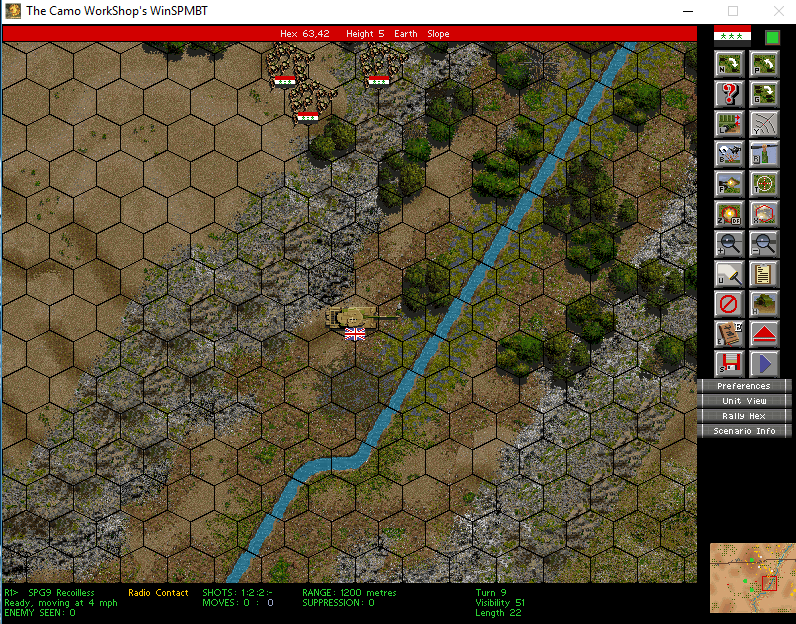 South of the bridge, the cliff on the British side goes from elevation 10-15 to elevation 90-95 in a single hex, with lots of impassable hexes. Given the high visibility, attempting to push over that cliff will be too risky. This is too bad, as two VP clusters are behind that hill. In the northern portion, the Marauders will be able to deploy west of the river, relatively close to the third VP cluster. That VP cluster is located right between two hills of elevation 100, so that position should allow the Iraqi force to dominate the battlefield. At least that's the plan - strong push in the north, with pretty much the entire force, followed by either a defense or a push south, with the two 100-elevation hills serving as a fire base for the support weaponry. Given that the enemy forces in all three previous battles consisted of infantry only, and given that this is most likely due to the low point cost of the Iraqi force, I've decided to buy two sections of ammo carriers (2 vehicles each), a platoon of 100mm AT guns (mechanized, as all units with speed less than 3 need their own transport to keep up), and a platoon of T-55s. 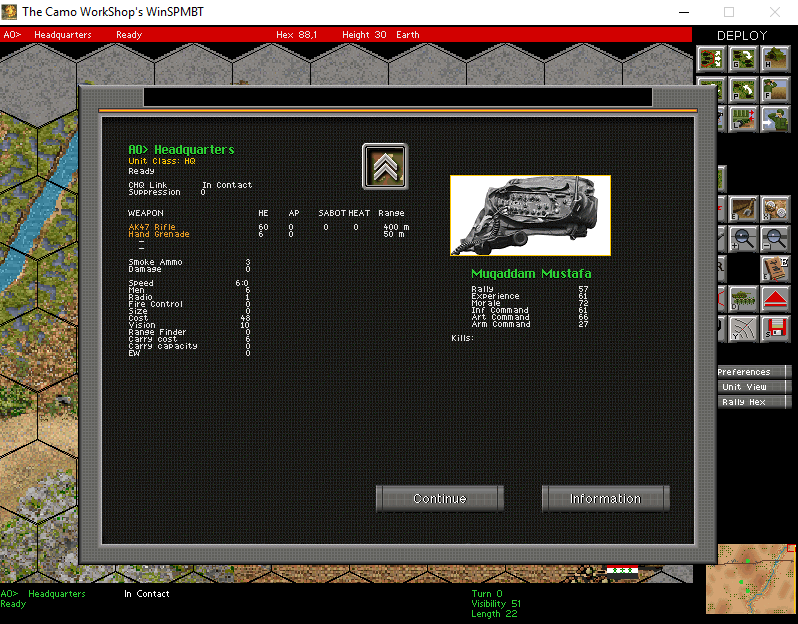 These additions swelled the point cost of the force, which will hopefully allow the AI to purchase some armor or artillery, but the units themselves are intended for limited use. The ammo carriers will never fire in anger if I can help it, unless perfectly safe. 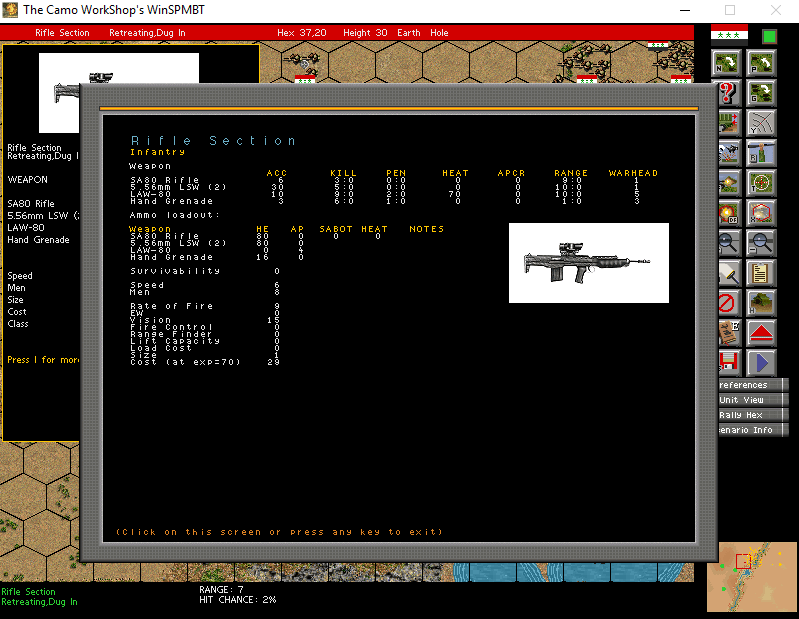 The AT guns provide a slightly better (still low-tech) answer to enemy armor, but are not particularly effective vs. infantry. The cost of each gun, including its dedicated transport, is 60 points, or about two Peoples Army platoons. Finally, the T-55s are not intended as front line troops, but rather as precious assets that the Marauders intend to preserve. The supply lines no longer exist, scrounging the battlefields yields mostly ammunition for the ubiquitous AK-47s and such, but not necessarily T-55 ammo, and no one has the time to fix a damaged tank. So, the T-55s, while costing full points, will essentially be kept out of combat. For the last time, the two batteries of 130mm M46 FG will make their appearance - again, their 10km+ range allows them to aid Lt. Col. Mustafa and his men without having to actually join the Marauders themselves. No other support is available. 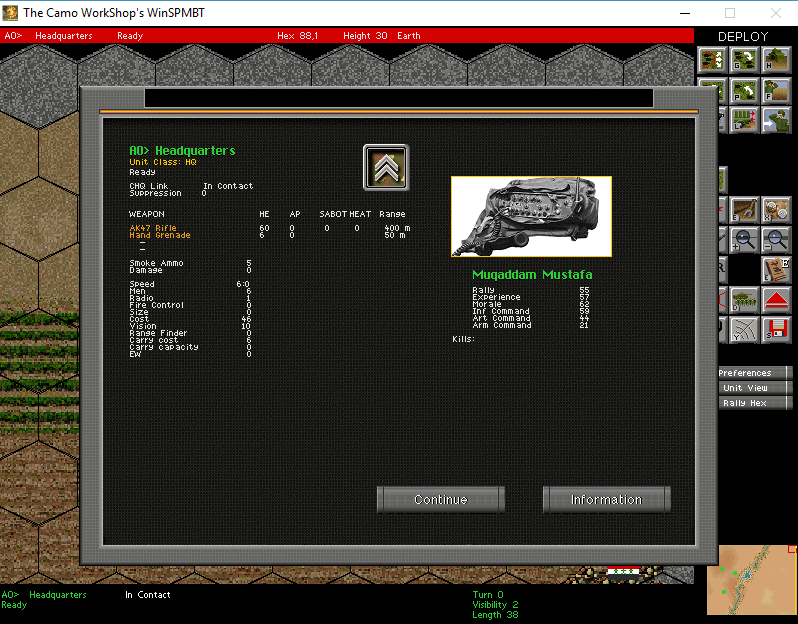 It looks as though the method worked - by expanding my core with relatively expensive units that I won't be heavily using, I gave the AI the opportunity to recruit some armor. The British have brought the Challenger I tank to the field. As subsequent events would show, it is only a section of two tanks, but they are enough. Virtually impervious to all my weapons, except for the AT gun (if it can ever get into position), or the RPG/recoilless (rear shot only), the Challengers are the kings of the battlefield. Now, this challenger tank went all the way to the river - what was it looking for? I don't know. I tried to patiently position my AT units to take a rear shot, but the turn limit is only 22 - I have to push for a decision. The Iraqi troops captured the northernmost VP cluster, but the two southern ones, as expected, were captured by the British. The only way to get at them is to destroy the Challengers. Interestingly enough, the Challenger did not take pot-shots at my jeeps or trucks, even the trucks that were carrying AT-guns. However, it must have seen them, as British mortars drew first blood and destroyed one of my AAMG jeeps, and retreated another off the map. It proved impossible to directly take on the British armor. The Challenger that went furthest east was eventually close-assaulted by a mountain platoon, but it held off my advance long enough to protect the VPs behind it. ... if it weren't for a judicious artillery barrage. Artillery really earned its place in this battle. The HMGs and grenade launchers were simply too slow to keep up with the Iraqi infantry, so at the point where the "meeting engagement" battle became a true meeting, the support weapons were far behind. Due to the 22-turn limit, there was no time to wait for them. Had it not been for artillery, Mosin rifles would have squared off against modern assault rifles and machine guns. 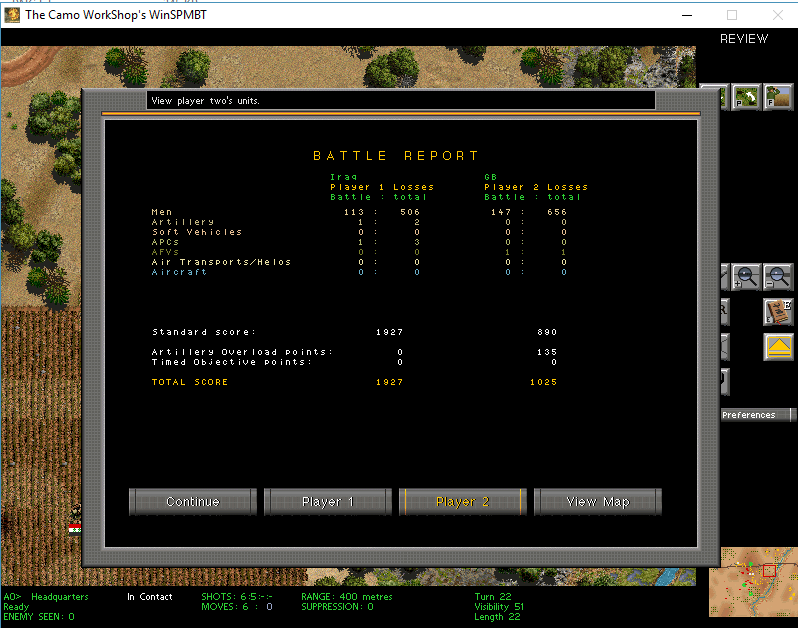 Even so, the artillery barrage only stopped the British, but did not allow me to annihilate them or take their VP clusters. The battle ends a draw.